We have a funny tendency in our family – in a decent chunk of the population of Duluth, actually – to think of Alaskan salmon as local. It’s not. It’s from Alaska, actually (you guessed that?! How?!…). Our wonderful Lake Superior will cough up shoals of herring and a lake trout or two. But nary a native salmon swims in its waters. However, we feel an intense sense of local pride about salmon because a huge portion of the salmon in the grocery store, much of the salmon in restaurants, all of the salmon at the Lutheran church’s lutefisk, meatball, and salmon supper, and certainly all the salmon my family and our neighbors eat comes from our dear friend Dave, who lives in Duluth but journeys each summer to Alaska to fish and brings back his bounty. It’s wonderful! My parents always purchase and freeze a couple of these massive bad boys to last them through until the next year, when Dave will bring back a new haul. Eric makes smoked salmon fillets with different spice rubs on them and they use them in sandwiches at the Smokehaus complete with homemade spreads on fresh bread (they also make sandwiches with his cured meats and cheeses from local dairies – it’s totally rockin’!). The Cajun Fin, a sandwich with Cajun smoked salmon, herbed cream cheese, and a pile of veggies including roasted peppers is my very favorite. Even when my parent’s kitchen isn’t under construction and there’s no need to go out to eat, I make an exception and hunt down a Cajun Fin every single solitary time I’m in Duluth. Whenever I’m in town, I always require that we cook Dave’s salmon at least a couple of times for supper. (What can I say, I’m a little demanding.) Dave also makes and sells his own maple syrup from the trees on their property, and he taught us to prepare his salmon with his maple syrup. 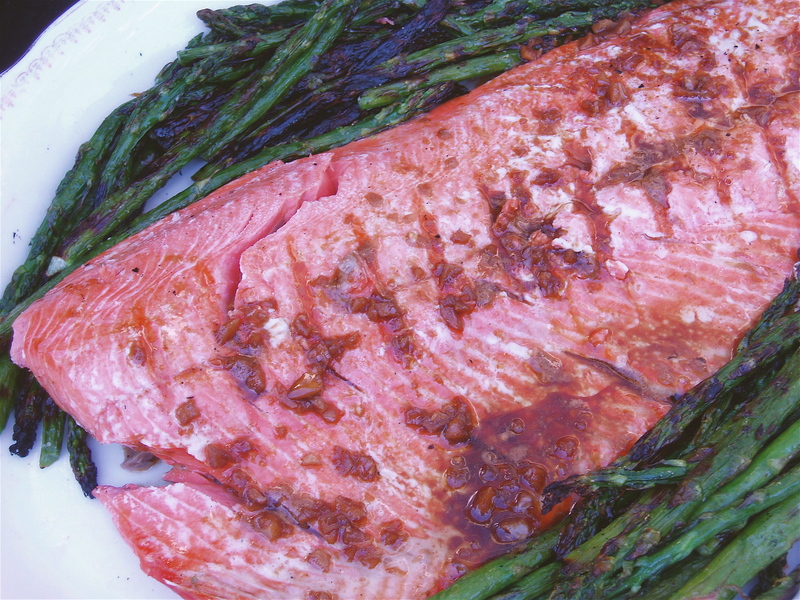 It has become our classic salmon preparation, for either grilling or baking. Just add a little soy sauce for saltiness to complement the sweet syrup, and a little garlic and ginger to flavor it up in a Hoisin-sauce like glaze. With brand new asparagus from nearby in Wisconsin (they’re on the other side of the Lake so they have an entirely different climate and growing season!!) and roasted potatoes from “The Food Farm” and you’ve got yourself a perfect supper. 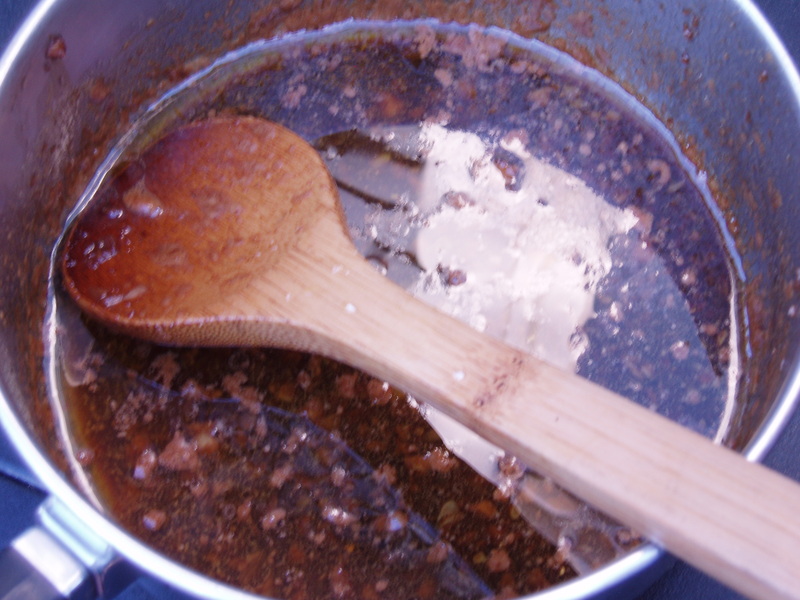 In a small sauce pan heat the olive oil and the butter together over medium heat until the butter is bubbling. Add the garlic, ginger, soy sauce, and maple syrup. Turn the heat to low and simmer for about 5 minutes. Set aside. 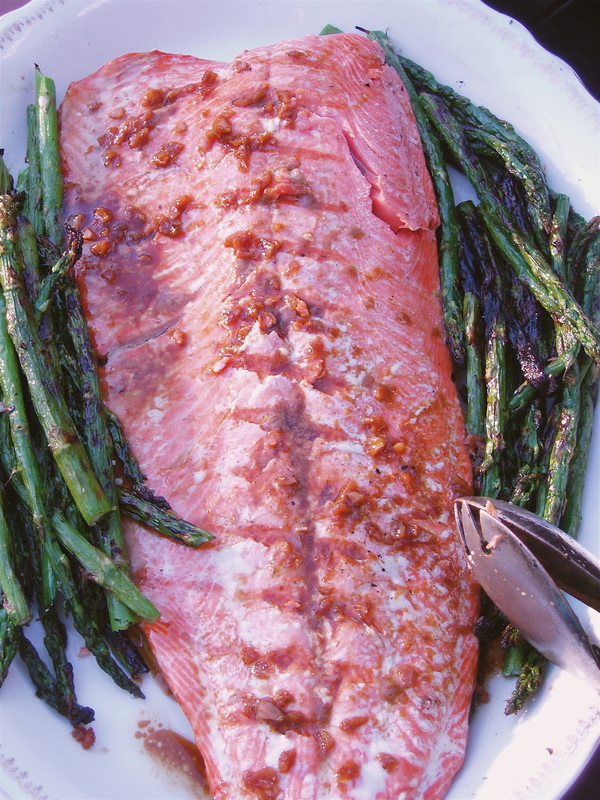 If baking the salmon, put it skin side down on a greased baking dish. Bake in the oven at 400F until it is light pink on the inside and flakes easily with a fork, I’d say about 25-30 minutes. 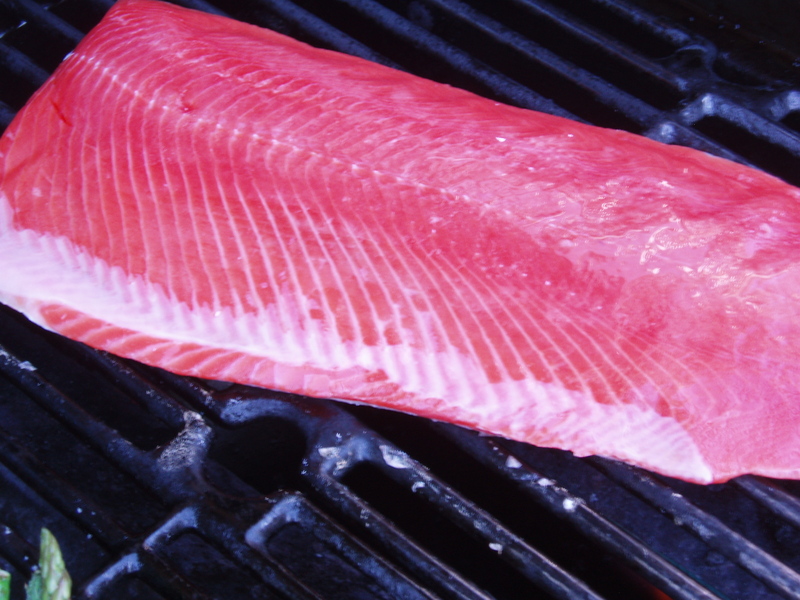 If grilling, oil and preheat the grill and grease the skin side of the salmon (or you can grill it on a piece of foil so you don’t accidentally get it completely stuck to the grill bars like some of us tend to). Grill skin side up first then flip, until the salmon is cooked through and flakes easily with a fork. About 5 minutes per side. If the sauce has gotten cold, reheat it briefly. Place the cooked salmon on a serving tray and pour half the sauce over it. Serve the rest of the sauce along side for people to pour on extra. Serve with roasted or grilled veggies and roasted potatoes. Emily, Lake superior does have salmon. They are not native but do reproduce and are a popular sport fish. What do you think all those guys standing in the water off Lester River are doing? No way! I assumed they were fishing for trout, I guess. Well, they certainly didn’t teach us that in our Lake Superior aquatic biology classes, but duly noted. I’ll change my observation! OK. I’m hooked. LOVE your blog. I was just saying yesterday that I don’t think I can ever move away from these intense Duluth winters, simply because of the local food sources I’ve found. How can I give up my raw, yummy, Wargin’s milk?? My food farm, even for a season (I’d never get back on, with their mile-long waiting list!)? And all that yummy grass-fed beef at the Thell’s? My goodness, we are lucky to live here. Thanks for your blog. Can’t wait to visit that lovely Grand Marais dairy…. Thanks for pointing that out. Dave is definitely a commercial fisherman. He provides salmon to many local restaurants and grocery stores in Duluth as well! Thanks for the recipe! This salmon sounds awesome… can’t wait to try it! You are currently reading Maple salmon – Going local in Northern Minnesota – part 2 at Five And Spice.